Left to right: Sakuna Ramsay, Jacqueline Cameron, Louise Graham and Agnes Freeman. Jacqueline Cameron (Alyth), the top seed, came out on top in the match-play stages as well when the Angus women's county golf championship was concluded over the Montrose Medal course at the weekend. 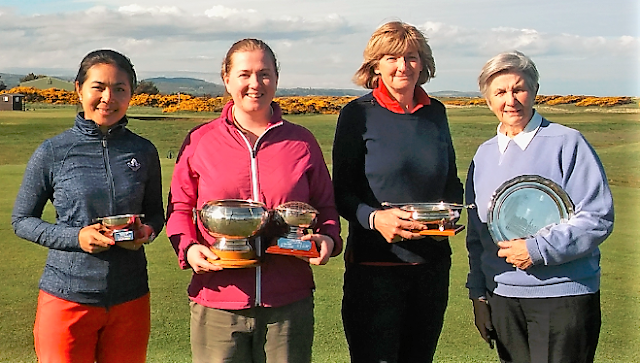 Jacqueline, who also won the county title in 2016, ended the good run of Sakuna Ramsay (Edzell), seventh of the eight match-play qualifiers, by beating her 7 and 6 in the final. The handicap title was won by Louise Graham, who plays off seven at Carnoustie Ladies Golf Club. She won by 5 and 4 against Agnes Freeman, a 13-handicapper at Panmure Barry. D Leask (Montrose Mercantile) bt D Dargie (Monifieth Grange) 1 hole. Cameron bt A Ramsay 2 and 1. S Ramsay bt Leask 3 and 2. Freeman (13) bt Duthie (14) 3 and 2. Graham (7) bt Freeman (13) 5 and 4.